The discovery could lead to advancements in diverse fields including chemical manufacturing, pharmaceuticals and miniaturisation. For the first time ever the research team in the Department of Physics was able to use a physical effect – specifically the colour-changing of light scattered from chiral molecules – to measure the chirality present, confirming predictions of theoretical work from the 1970s. The technique is 100,000 times more sensitive than standard methods used today. For decades scientists had sought to prove that you could accurately determine the chirality of molecules by measuring a colour-changing (nonlinear) effect upon illumination with twisted (circularly polarised) light. In theory, twisted light could change colour and then scatter differently from differently handed molecules – but this had never been demonstrated experimentally. 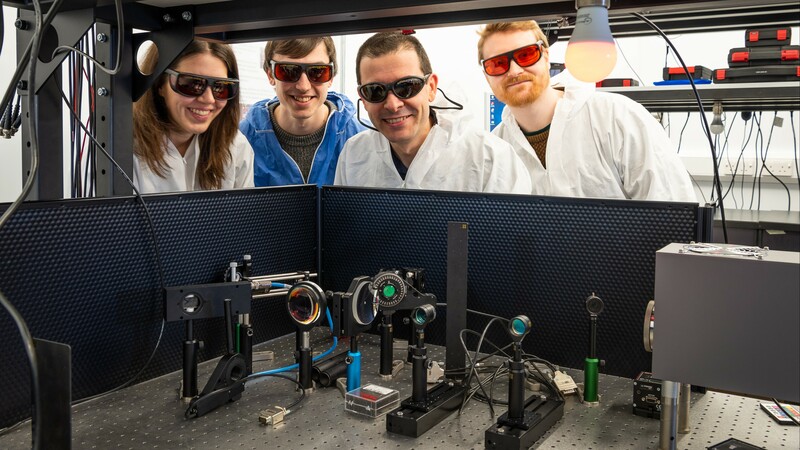 Dr Ventsislav Valev, who leads the research group in the Department of Physics at the University of Bath, said: “We’ve demonstrated a new physical effect – you don’t get to say that every day. This is exactly why I got into science. PhD student Joel Collins had an incredible moment when running a series of tests on these springs. “We kept repeating the experiment to make sure it was actually a real effect and we saw that not only it’s there but it’s huge – we were only using really low concentrations of our nano-helices. Dr Valev added: “It’s taken 40 years, people have been looking for this without success, and not for lack of trying. It’s amazing. The theory was quite controversial, people thought that maybe the effect was impossible to observe, maybe something else was there, blocking it. “Now we have a method 100,000 times more sensitive, free from false positives. There’s a new kind of manufacturing process currently emerging. It is called “lab-on-a-chip” and our effect fits very well with it. Professor David Andrews, from the University of East Anglia, theorised the effect 40 years ago. He said: “Dr Valev’s pioneering work is a clever and highly significant achievement, for he has realised a kind of application that could never have been imagined when the theory was first laid, forty years ago. Next, the researchers will be using their findings to characterise chiral molecules and to develop its technological applications. The paper “First observation of optical activity in hyper-Rayleigh scattering” is published in Physical Review X. DOI: 10.1103/PhysRevX.9.011024. The research was funded by The Royal Society, the Science and Technology Facilities Council (STFC) and the Engineering and Physical Science Research Council (EPSRC).